Hey! So, big news: we recently managed to recover cached versions of PHWOnline, the GMod comics site from the old days. That means a lot of old comics are now being retrieved, which should help keep the content coming for a while! 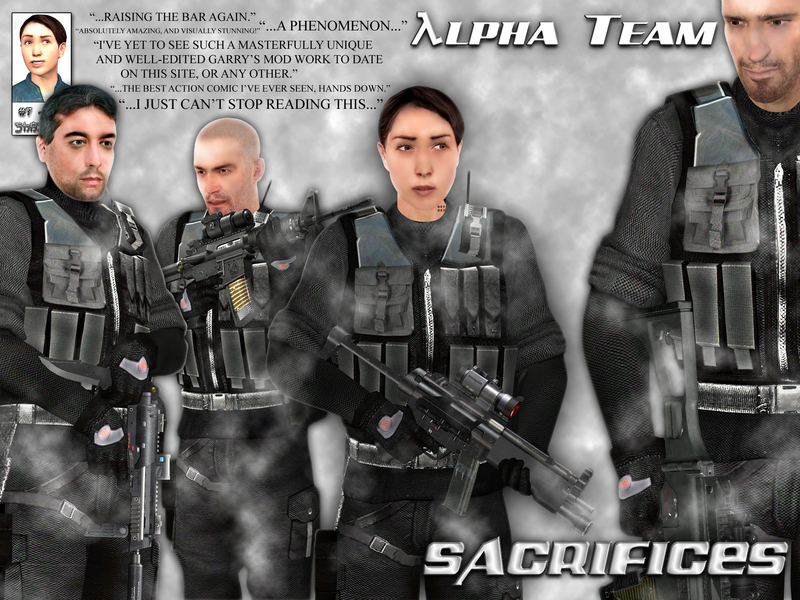 Like its author, Alpha Team is a polarizing icon in the history of Garry’s Mod comics. Once revered for its advanced visuals, the comic was also criticized for its excessive profanity and casual distortion of the Half-Life 2 canon. In hindsight, Alpha Team has become synonymous with the personality of its creator: self-obsessed, grandiose, and lacking substance. While criticisms regarding the comic’s cartoonish overdependence on Photoshop “gimmicks” were usually well-founded, the callousness with which the comic was often criticized hints at an underlying jealousy among some of its readers. For all its excesses and gimmicks, Alpha Team played a key role in modernizing the look and feel of Garry’s Mod comics. Featuring meticulous lasso-tool isolation, manual depth-of-field editing, and other time-intensive editing techniques—all of which was packaged into a sleek widescreen layout—the comic was one of the first to showcase the effectiveness of combining an intricate layout with intricate visuals. The fourth installment, Sacrifices, released at the close of 2006, represents the zenith of Shazbot’s editing prowess. Due to misconduct, the author was banned from the site altogether shortly after its release. The influences of Alpha Team are still apparent today: some of the same editing techniques first attempted by Shazbot are still being used by present-day comic makers, if somewhat more effectively—and sparingly. If you’re curious to read Alpha Team after that, click the cover below to get redirected to the comic. Enjoy! Previous MadmanMad Returns with Madventures!